DESCRIPTION Cloud-like pendant highlighted by a scalloped hand-blown glass diffuser available in 2 sizes and 4 glass finishes. 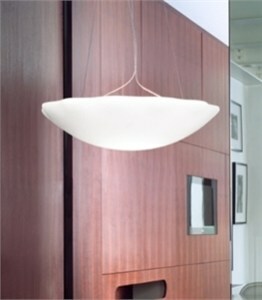 Companion pendant, wall and ceiling designs are available. CONSTRUCTION A fixed, tripod structure supports the glass diffuser and halogen light source which provides upward and diffused illumination. Mounts directly to a standard 4� junction box. LIGHT SOURCE 1 x 200 watts, Quartz halogen, recessed single contact (provided). FINISHES Polished Chrome, Polished 24K Gold Plated.